I’ve never seen an actual angel, not that I know of, at least not while I was awake. I know people who have – and some of them are the scientifically-oriented type not given to flights of fancy. I gather it’s a rather startling experience. I’ve sung about them quite often. I’ve read about them too, but like most folk the pictures of angels I’ve been acquainted with came from Christmas decorations, Baroque paintings, corner gift shops and carved stones in cemeteries. I’ve seen them in dreams though. One leaned down low and told me a secret that explained a lot of previously unexplained events in my childhood. Another time, after I had been praying about what action to take I saw an angel pointing to the trail I often walk on when I go to pray. He was leaning on the please-clean-up-after-your-dog sign and smiling. I have seen angels in uniform in my dreams, in battle fatigues, in air force uniforms, and one dressed as a cable guy. He was in my house repairing something in the wall where my husband and the boys had once threaded a wire that connected their computers so they could play games together. Shortly after that I noticed a definite improvement in communication in their relationships. When I hear people’s stories of real live encounters I become envious. I have sincerely prayed for my eyes to be opened like Elisha’s servant so I could see too, but every time I have done that someone close to me sees something, and I don’t. 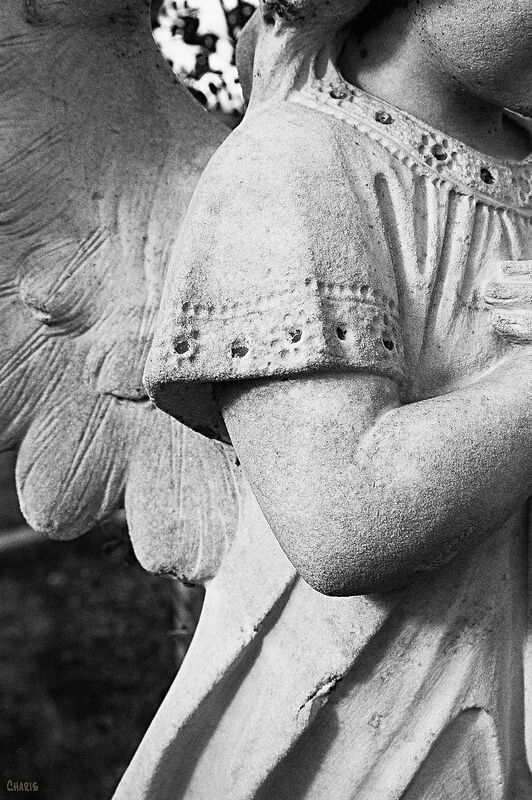 When our son-in-law lay dying several people told me about seeing angels around him. One praying friend in another part of the world sent a message telling me about the angel she saw in a vision. Within a few hours I heard two other people who were there at the hospital describe seeing exactly the same thing. Some people saw two very tall angels on guard duty on either side of the door to his room. Some saw angels crowded in the room and hallways. Some saw angels holding his head. He didn’t die. He was miraculously healed. Just before that season when the doctor thought I had cancer, then my mother-in-law was in ICU for heart problems and surgery, our son-in-law had flesh-eating disease, and our son’s family’s home and community was nearly destroyed in a flood, etc. etc. etc. I prayed to see angels. I didn’t. My husband did though. He’s really a down-to-earth guy, a scientist, but he old me excitedly the next morning that he dreamed (or he thought it was a dream) that he answered a knock on the door and a bunch of very big angels walked past him into the living room. He said they all dressed and acted like rugby players. Big tough rowdy guys. Maybe I haven’t seen angels because I might be so distracted I would forget to do my part in the battle, which seems a lot like pulling out little Lucy’s tiny dagger in the presence of a whole huge army of threats and ugly hatred like she did in a battle in Narnia. The Bible talks freely about angels, and how they are servants of God. They are not made of stone or paper or cookie dough and they aren’t chubby babies with aerodynamically impossible tiny wings. We don’t worship them, but it’s good to know the angels who worship the Creator of the Universe and see him face to face help us fight the good fight. I trust the Lord sends them where he needs them – and where I need them when I pull out my little dagger. There are more accounts of angel sightings in the book, While He Lay Dying. I can hardly wait to read this book!! I can hardly wait either. It’s hard to see it with other people’s eyes when you have been in the midst of a project for a while, but I am excited to have other people share this experience via the book. Thanks for this Melody! I loved this reflection on angels and life… I keep joking with my physiotherapist & chiropractor when they work on my various back/ spine/ neck issues that “my wings are stuck” – I think of myself more, as a bird than an angel…but it makes us all smile and carry on with our day. Hi Susan! Someday I’ll tell you the vision of the red-footed booby. It’s a bird that knows how to soar on the thermals and only comes on shore once every few years. No flapping necessary. It, like you, was meant to live at altitude.